CITIES IN GERMANY and the Czech Republic are scrambling to stave off potential disaster as a flood wave heads north, sending thousands of people fleeing their homes. Hungary has also declared a state of alert as waters surge in the mighty Danube, which is also threatening cities in Austria. In the Czech Republic, where eight people have already perished in the floods, thousands of households in the north are without power, gas and drinking water. Several cities in the north of the Czech Republic and eastern Germany are threatened by the surging waters of the Elbe river, after torrential rains across swathes of central Europe. 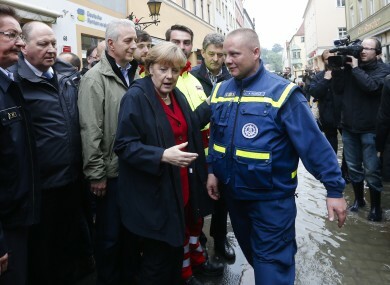 In the German city of Dresden, near the Czech border, several hundred people have been evacuated from their homes, after water levels in the Elbe were forecast to reach up to nine metres. Across the Czech Republic, there have been 19,000 evacuations since the floods began. Water levels in the Elbe were expected to peak in the Czech industrial city of the Usti nad Labem on Wednesday, according to Jiri Petr, a spokesman for the Povodi Labe water company. The rising river has already forced 3,700 people from their homes in the city, which lies about 30 kilometres from the German border, and flooded the local railway station. The water levels expected in Usti nad Labem are close to those recorded in 2002 when massive flooding swept central Europe, killing 17 people in the Czech Republic alone. In addition to the eight people already declared dead, Czech police are still searching for four missing people. Email “Thousands of homes evacuated as floods threaten more cities”. Feedback on “Thousands of homes evacuated as floods threaten more cities”.